When it comes to effective and affordable water treatment for the residential consumer, we recommend a reverse osmosis drinking water system. With the quality of our drinking water increasingly coming under question, people are now looking for alternative sources of quality water. Reverse osmosis drinking water systems provide the most convenient and economical solution. 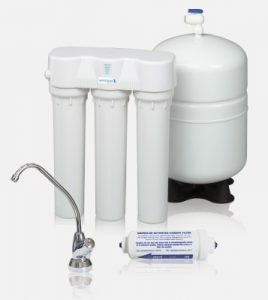 Neatly stored under the counter, or mounted on a wall in your basement, the reverse osmosis drinking water system provides you with clean and delicious water right from its own dedicated tap. 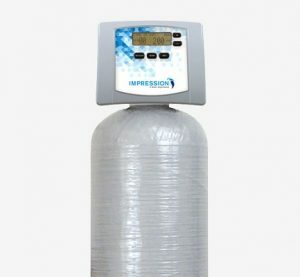 The Impression® Reverse Osmosis drinking water system reduces harmful contaminants and turns common tap water into the fresh, quality water that nature intended us to drink. A four-stage system filters water down to the molecular level. Drawn water passes through a final carbon filter to remove any unwanted tastes or odors. The result is simply healthier, better tasting water. 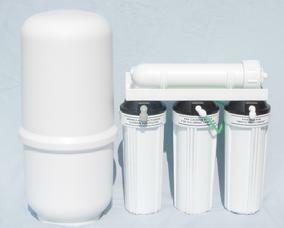 There are numerous options for installing a Reverse Osmosis system. 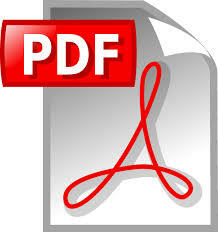 Contact us for a free, in-home estimate, to determine which is best for you! Our reverse osmosis systems consist of three filtration processes: a sediment filter, a carbon filter, and the reverse osmosis membrane. Natural pressurization forces water through the entire system, beginning with the sediment filter. This step removes all sediment larger than 5 microns. Next is the carbon filter, which primarily removes chlorine and other unwanted chemicals from the water supply. Finally, the water is processed through the reverse osmosis membrane, and stored in a storage tank. When the faucet is used, the water flows out of the tank and through a second carbon filter. Reverse osmosis is sometimes referred to as “ultrafiltration”, as it only allows water molecules, nothing larger, to pass through, leaving behind various minerals and solids which are disposed down the drain port. Pure water then flows down the drainport. The final result? Pure water. Bottled water quality – conveniently – at a fraction of the cost! Contact us for a free, in-home estimate, to determine which is best for you! The environmentally safe whole house water filtration system.